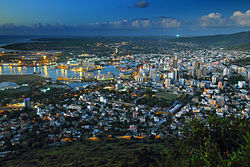 ↑ Municipal & District Councils in Mauritius. Government of Mauritius. http://www.gov.mu/portal/site/mlge/menuitem.f9c1c444c628df3cb3347524e2b521ca/#br۔ اخذ کردہ بتاریخ 24 July 2012. ↑ Digest Of Demographic Statistics 2010. Government of Mauritius. p. 33. http://www.gov.mu/portal/goc/cso/report/natacc/demo10/demo10.pdf۔ اخذ کردہ بتاریخ 24 July 2012.